Art and music are a central part of the Southwest Detroit Community. Creative Art expression has long been a spiritual practice of those who have lived in our neighborhood. In 2011, Eva Leventer developed Grace in Action's Youth Art Initiative. Today it is run by Phillip Patrick and Anahli Vazquez. Here are some of the various projects that have been developed through that work. 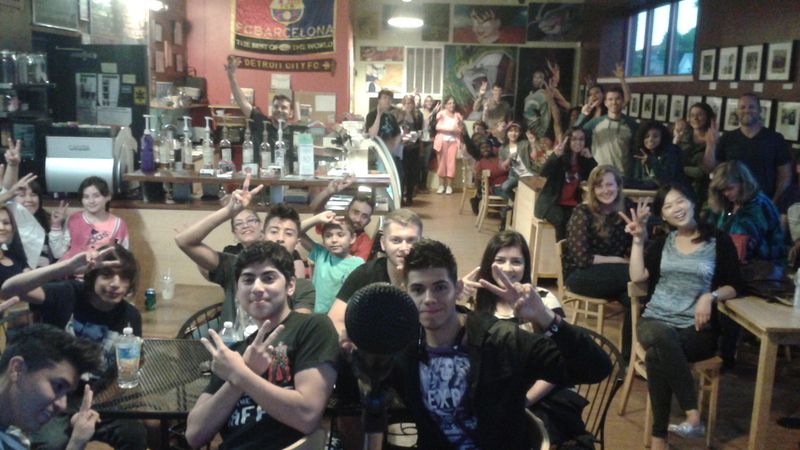 Every other month, Grace in Action hosts an open mic night at Cafe Con Leche. This is a space for poets, artists, musicians to come and share their work with all those gathered. Each time we gather the group is different, but the community of respect and support remains consistent at Cafe Con Leche open mic nights. Every monday night from 6:30 - 7:30 PM young people gather for guitar lessons. These lessons are taught by local young adults and parent mentors who are gifted guitarists. Together they have created a three level curriculum. If interested in being a part of Guitar Classes contact Pastor John.